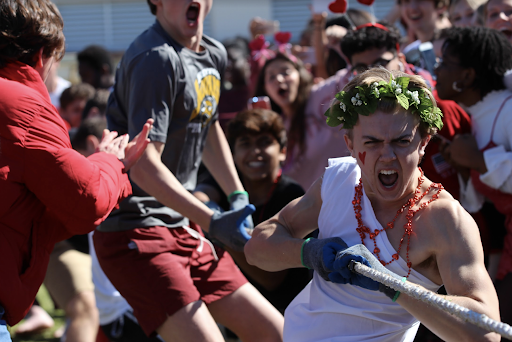 Dressed in a toga with a red heart drawn on his cheek for the Valentine’s Day theme, communications junior Tommy McCabe shouts while pulling the tug-of-war rope. Cheered on by classmates on the sidelines, the junior class won. While the students poured onto the soccer field, visual junior Alexis Sanchez took on the role of DJ, queuing the latest hip-hop favorites. SGA officers hurried along the sidelines to organize competitors, using megaphones to project over the booming music. Crowds gathered on the sidelines as the games began. 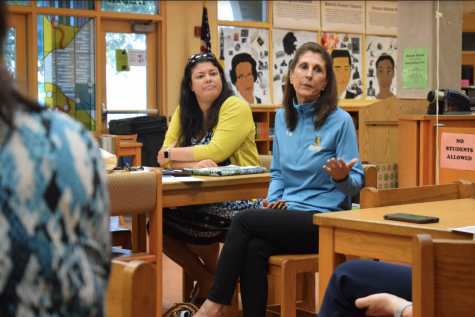 SGA Co-Historian and digital media senior Sofia Campanella spoke through a microphone near the DJ’s table, giving directions and making announcements as students prepared for the Field Day events. Tuesday’s Field Day lunch activity saw both returning events and new ones, totaling in five competitions. Overall, Field Day resulted in a 2-2 tie between juniors and seniors, while freshmen won one event and sophomores did not take any wins. 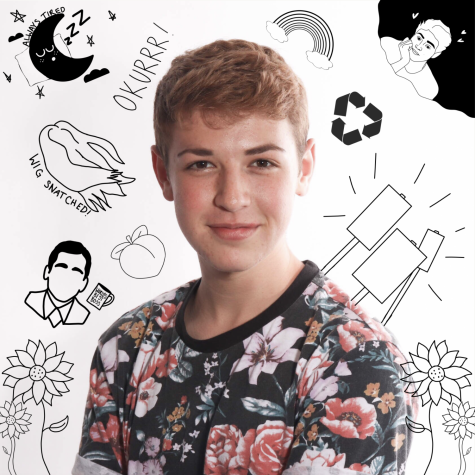 Communications sophomore Jasper Weinberg swings a tennis ball inside of pantyhose in circular motions, using his head. Sophomores placed last, having taken the longest to knock down the bottles. Kicking off Field Day, competitors lined up for one of the new events. Seniors ended up in first place, with juniors in second, freshmen in third, and sophomores placing last. 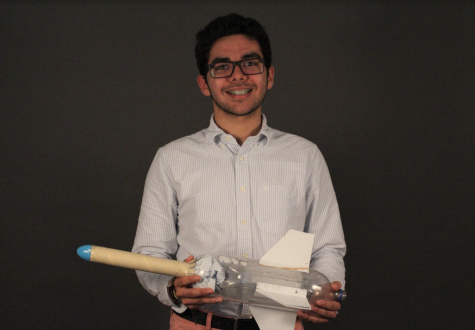 “It was harder than I thought it was going to be, but it was fun,” communications sophomore Jasper Weinberg said. Pantyhose holding tennis balls hung from students’ heads, and once the game started, participants swung their heads in circular motions around water bottles assembled in triangle formations. Competitors aimed to knock over all of the bottles. Vocal senior Mickela Pitter pours water from the bucket over her head into the bucket of the teammate behind her. The senior class came in second place. Next was another new addition to Field Day. 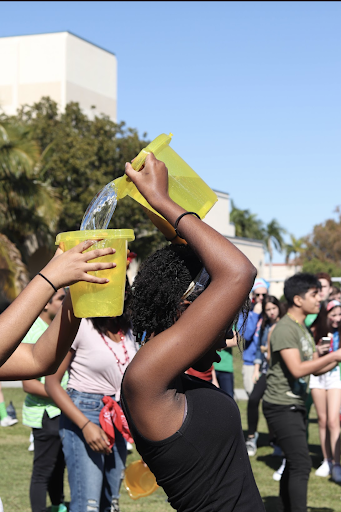 Dubbed the “Over/Under Challenge,” the game involved buckets of water—and students’ heads. 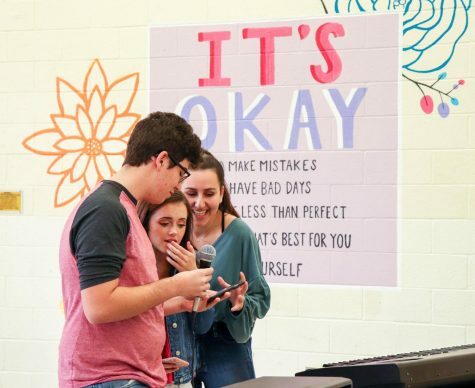 Freshmen placed first, eliciting cheers and gasps of surprise. Following were the seniors in second, sophomores in third, and juniors in fourth. Some spectators were confused at the object of the game but supported their classmates nonetheless. The game entailed the first of five students maneuvering a bucket full of water over their head, pouring the water into the bucket of the student behind them. Then, that next participant was expected to move their bucket under their legs and pour it into the next competitor’s bucket. After that, the pattern continued. 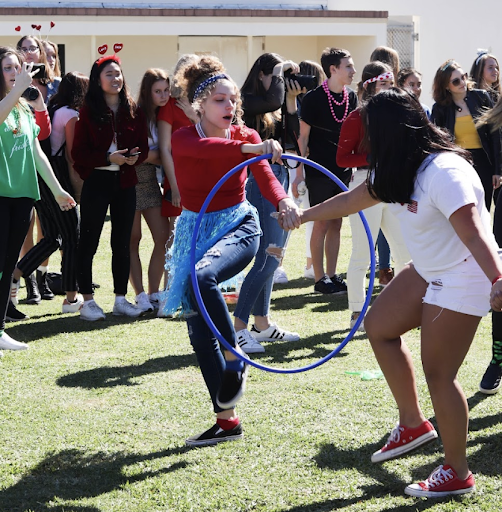 Communications freshman Veronica Longoria passes a hula hoop to her teammate, without breaking their grip. The freshman class came in second place. Returning as a Field Day classic, the Hula Hoop Chain event required teamwork, speed, and flexibility. Seniors finished first, adding another win to their record. In close pursuit were freshmen, followed by juniors in third, and sophomores in fourth. Competitors held hands in a line and had to pass a hula hoop from one end to another without breaking the link. While the sophomores continued a losing streak, some remained optimistic. “We did place last, but it was definitely competitive, and I think that we can only go up from here,” communications sophomore Natalie Cohen said. 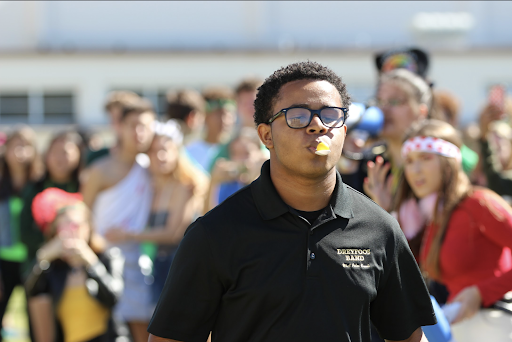 Taking time to keep stability, band senior Aidan Dixon balances a gumball on a spoon in his mouth. The senior class placed second in the Gum Ball on a Spoon competition. Testing speed, patience, and stability, Tuesday’s third event was a Gumball on a Spoon relay race. 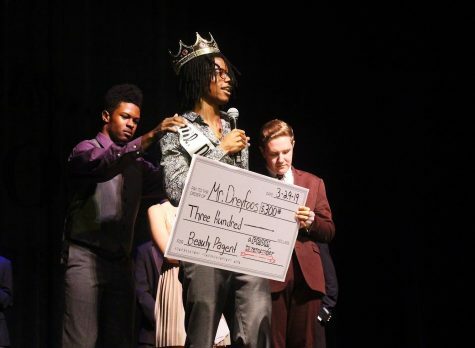 In first place was the junior class, with seniors placing second, freshmen placing third, and sophomores placing last. 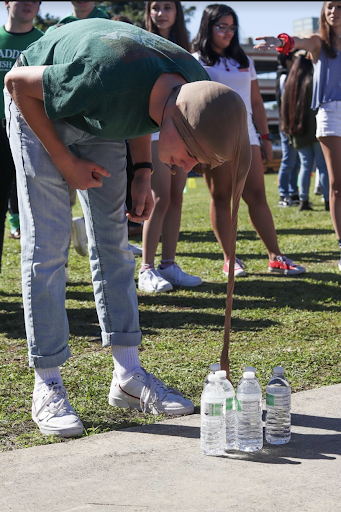 Students speed-walked across the designated distance, looped around cones, and rushed back to the line of eager contestants, all while balancing gumballs on plastic spoons in their mouths. Carrying on the well-received tradition, teams braced for the annual Tug of War. The juniors won, with seniors placing second, sophomores placing third, and freshmen coming in last. Leading up to the game, SGA officers knew it would be the main event. Prior to their match, a group of junior boys huddled into a group, jumping and chanting before heading to their end of the rope. Participants were each handed thick gloves to protect their palms from potential rope burn. Taking their places along the rope, students on opposing sides gripped the rope and dug their shoes into the grass. When the whistle blew, competitors let out grunts and shouts as they stumbled to maintain balance and pull. “It was really exhilarating and exciting,” band junior Juan Azanza said.